An Iranian governor blamed "foreign agents" for the deaths of two demonstrators on Saturday, as the country was hit by street protests for the third day running. 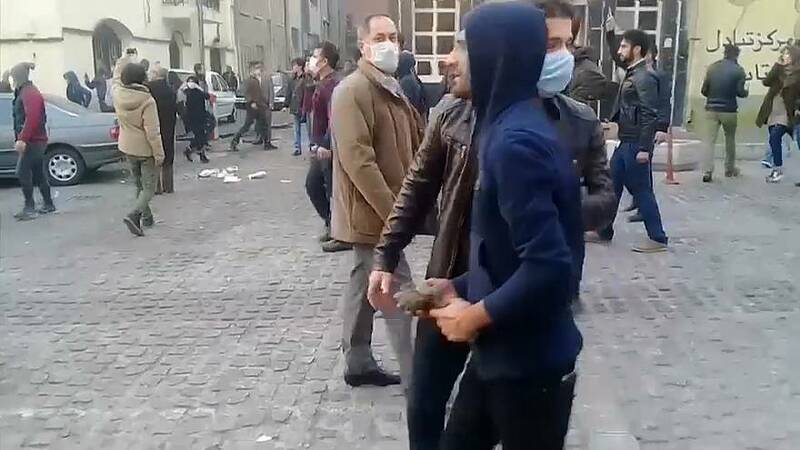 Crowds confronted police and threw stones in the capital Tehran, including around the city's main university, in what are the most serious anti-government demonstrations since 2009. There were also protests in other cities. Footage shared on social media from the city of Dorud showed what appeared to be the bodies of two young men covered in blood as a voice is heard saying they were killed when riot police fired on protesters. But Habibollah Khojastehpour, the deputy governor of Lorestan province, said in an interview on state television on Sunday that police had not been involved. "No shots were fired by the police and security forces. We have found evidence of enemies of the revolution, Takfiri groups and foreign agents in this clash," he added. Takfiri is a term used for Sunni militants particularly from the Islamic State (ISIS) group. Dozens of protesters have been arrested since Thursday, triggering condemnation from the United States. President Donald Trump tweeted: "The entire world understands that the good people of Iran want change, and, other than the vast military power of the United States, that Iran’s people are what their leaders fear the most. But the Iranian government said its people saw "no value" to Trump's "opportunistic claims". Tens of thousands of people attended counter-marches in support of the regime on Saturday.